CHECK IT! 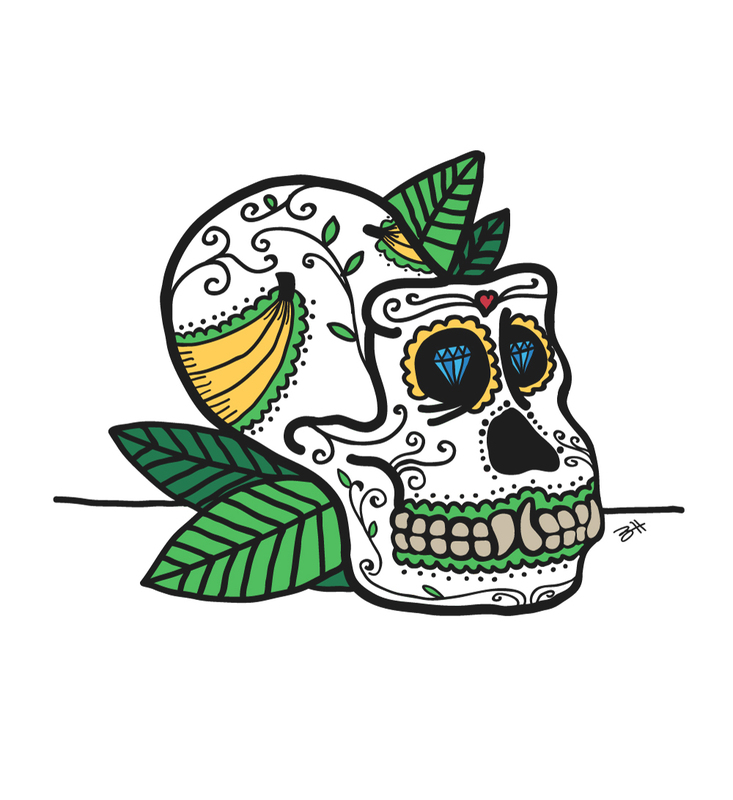 You can now purchase Gorilla Sugar Skull in t-shirt form here! I’m fascinated by sugar skulls and skeletons in general. I have awesome lino-prints of skeletons playing guitar and a sugar-skull Abe Lincoln and a few other strange skeleton pieces. I’m not sure what it is about skeletons I like so much but it could be that they are a reminder to live life as much as you can… I’ve believe death to be the end, but while some people believe that to be quite morbid and sad, I find it quite liberating in the fact we have one chance here on earth so we better make the most of it and do something amazing while we are here… don’t waste any time thinking this life is a trial-run! OK, enough of that… today I decided to draw a sugar skull in the “Sailor Jerry” old-school tattoo style that is popular with the young ones these days. I didn’t want to do the normal old human skull you see around and as I was sitting down to draw I started to brainstorm what kind of skull I would draw. An alien? an animal? a Star Wars stormtrooper? I was a bit perplexed at all the things I could draw. Luckily, a good friend on mine, Big Dave Streeter, an awesome illustrator in his own right, had come down from his farm to stay the night for a few Pales and a hot-chilli spaghetti bolognaise. I mention Big Dave because he has a video production company called GorillaVision and one of his great cartoon characters he has developed is named Gordon the Gorilla. So, that was it… Gorilla Sugar Skull! I quickly googled gorilla skull, used an image I found as a reference and went to work. You also may wonder why I put diamonds into the skull’s eye sockets… it is a little in-joke for all you Simpson’s fans out there… (yes, I know they are chimpanzees in that episode but hey… chimp, gorilla, they are all hairy ape-like things). I’m also not too sure if gorillas eat bananas, I’m probably being species-ist and for that, I apologise. Gorilla’s in the Mist – too easy! Funny though – I was just looking at sugar skulls for my new tattoo. Two Geeks in a pod Ben Hood. 23 minutes is mighty impressive! I really like this!